Our wonderful summer displays of Geraniums and Fuchsia have fizzled out with the first frosts. Now is the time to replenish our pots with some more interest. With winter waiting in the wings, we need colour ready to welcome us at our front door and on the patio and as we look out from our kitchen window. What better than rich vivid plants to lift us up and take us through the winter months ahead? You usually look up at a basket and down on a pot. Plant a selection of trailers or plants that drape well around the rim of the basket to fall over the sides. Ivy is an obvious and traditional choice. It comes in a number of different variations including yellows, silvers and greens. To add to this we can safely include Thyme, which grows in a multitude of shades and has the most wonderful twinkly texture. It is high in chromium, which I was told helps balance blood sugar. It certainly makes a great tea with a bit of lemon and honey for winter colds. I include it in all my winter stews. And when roasting Chicken, a sprig of Thyme and Rosemary, of course, is essential! Thyme definitely goes in my pots and baskets. We are limited in the amount of plants that truly trail gracefully so we improvise by planting plants with a bit of graceful fluidity when tipped up on their side. They don’t usually mind so long their feet are well planted! Equally brilliant in baskets and pots is Gaultheria with its beautiful red berries and rosy foliage, remembering to plant it in a lime free compost which it prefers. I can also recommend using heathers. The callunas varieties also prefer ericaceous soil. If you choose to use lime hating plants it is best to use ericaceous compost. It is has a reasonably neutral ph and the pansies and other plants you select will be fine mixed together. It also gives you the opportunity to use some upright ericaceous plants like Leucothoe Scarletta with rose-red leathery leaves and Pernettia, with its lovely violet red or cranberries berries, that must be bitter as the bird are reluctant to take them. I include Heucherella or Heucheras in almost all my baskets and containers. These are a highly collectable family of plants that have become really popular, with prominent stands in the marquee at Chelsea Flower Show. They have outstanding evergreen foliage colour. There are many shades available, rich red varieties, caramels, cinnamon, apricot, acid yellow. The variety Silver Scrolls has rich red etched or veined leaved. They are very, very colourful plants without ever having to flower. Unlike their friends the leafy Hostas the slugs leave them alone! Celebrate the simplicity of dark red and caramel foliage planted together. It will make the most wonderful planter. If you plant anything for winter it needs to be one or two of these beauties. We are defiantly growing more for next season, as they not only look good in the winter but look wonderful throughout the year. I mentioned Rosemary. Prostrate varieties weep beautifully over the rim of a basket or tub and more rigid up right varieties look perfect often as a centre piece. Another plant for all that looks good in all seasons. Purple sage is another favourite herb I frequently plant in winter pots. The tinge of purple is great and it’s a sturdy variety well tested by the RHS who have given it a merit award. Sage is also indispensable in my kitchen. I could not cook any pork without throwing a sprig in the roasting tin. I believe herbalist view it as natures own HRT. It is clearly a great plant. I often plant it alone in rich toned salt glazed fluted pots. Small Sage plants mix brilliantly in containers with other herbs and evergreens. Young evergreens in an array of colours will grace winter containers and basket beautifully from little Hebes to yellow Choisyas. I mentioned my favourite winter herbs but I am happy to plant these in my fusion baskets and pot selections of evergreen grasses, ferns and lax conifers, in containers all together. Adding a few final pansies or violas to pots, I feel is a little like adding the accessories to an outfit, curtains or cushions to a room, the finishing touches. I should just point out; through winter plants are almost dormant. The basket and tubs we plant can be quite full because they are not going to try and out grow into each other. Pot them into a good compost. Use a muti-purpose with added John Innes, Rose Tree and Shrub or Ericaceous, as required. Keep them moist but not waterlogged. 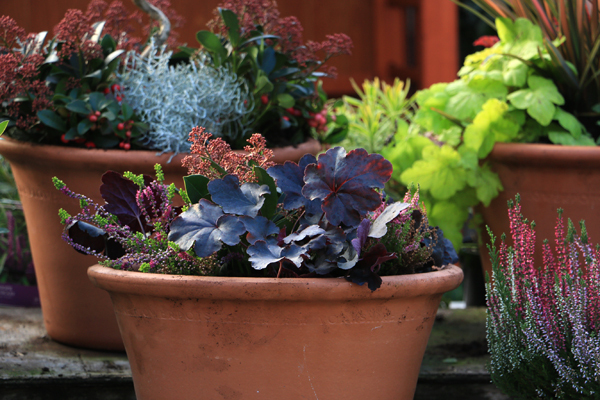 Don’t rely on drizzly days, pots are often sheltered from rain by the house and beware of drying windy days. Selecting ericaceous compost for your winter container is often the best all round choice as most of the plants will grow in standard compost or ericacous and you are then not limited with your planting and the exciting ericaceous choices available. In the late spring everything in our containers can be transplanted into the garden. They are actually a very good investment as we have all the pleasure of their colour while it is dull and there is no waste when its time to refill the pots next spring with Geraniums. The plants will continue to flourish in our borders.